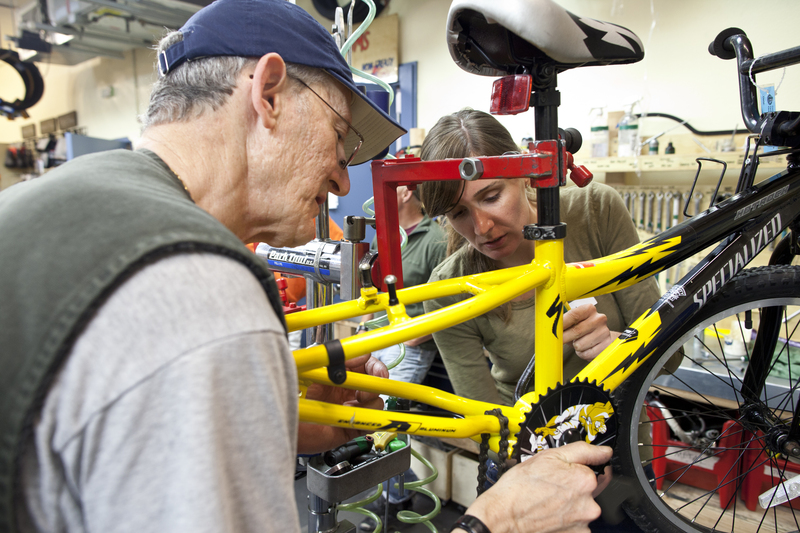 Home » Blog » From Community Cycling Center volunteer to professional mechanic…in Texas! From Community Cycling Center volunteer to professional mechanic…in Texas! In January we wrote about one of our volunteers, Ashley Haire. When we met Ashley she was new to fixing bikes. She said in the Volunteer Spotlight that she could “sort of change a bike tire.” Ashley threw herself into our volunteer program and before long she became a certified Holiday Bike Drive mechanic. Later, she ramped up her skill-set by joining our Guest Mechanic Program. “If you’d told me six months ago that I’d be able to assemble bottom brackets, true wheels, pack hubs, and adjust derailleurs and brakes, I would never have believed you,” says Ashley. When she had to move to Texas, for a full-time transportation engineer job, we were sad to see her go. Recently we heard from Ashley that she is now working for a bike shop in Denton, TX on Saturdays. She found their post while looking on Craigslist for bikes. Originally, Ashley was interested in keeping up her mechanic skills in a volunteer role, but now she’s working for them on Saturdays from 11am – 5pm as a paid mechanic. Bullseye Bike Shop is lucky to have her, and we are so proud of Ashley for putting the knowledge that she gained from our Volunteer Program to good use in Texas. Do you have any stories of using skills you learned at the Community Cycling Center in other places? We’d love to hear them in the comments below!